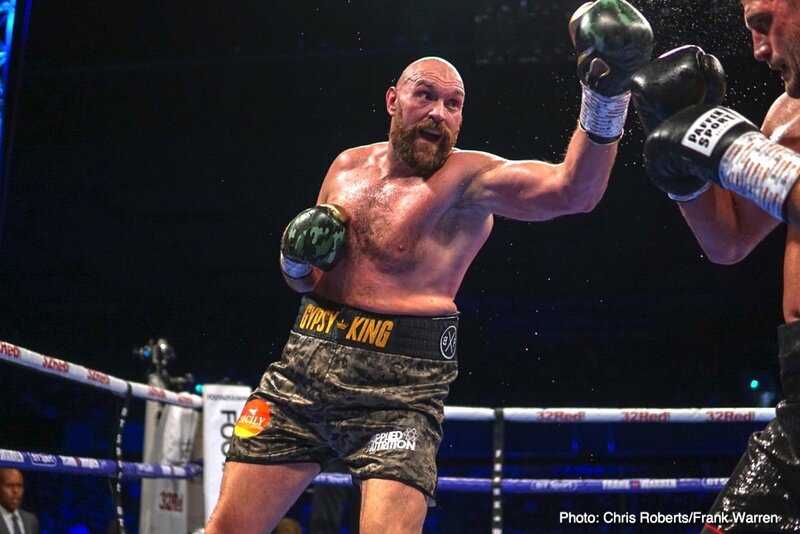 Tyson Fury (27-0, 19 KOs) stayed unbeaten with an easy 10 round decision win over Francesco Pianeta (35-5-1, 21 KOs) on Saturday night in his second fight of his comeback at Windsor Park in Belfast, Northern Ireland. The score was 100-90. After the score was announced, the crowd booed Fury. That was surprising though, as he’s from the UK and most of the interest from the Irish crowd was on Fury’s fight with Pianeta rather than he mismatch in the main event between Carl Frampton and Luke Jackson. The 6’5’ southpaw Pianeta tried his best, but he was unable to match the high work rate of the 29-year-old Fury. Pianeta was never hurt during the contest aside from a low blow in the 8th round. Both fighters looked slow and plodding. Fury was clearly the better fighter of the two, but he didn’t look as impressive as he had three years ago in beating Wladimir Klitschko. Fury still hasn’t gotten all the ring rust out of his system from having been on the shelf since 2015. It’s too bad for Fury that he won’t be able to get a couple of more tune-up fights under his belt, because his next fight will be against WBC heavyweight champion Deontay Wilder. The match was announced after the fight for December in the U.S. The date and venue will be announced soon, according to Fury’s promoter Frank Warren. Fury is going to need to be a lot better against Wilder than he looked tonight if he wants to have a chance of winning the fight. Pianeta, 33, was able to land a lot of his shots on Fury in the fight. It was lucky for Fury that Pianeta had no punching power to speak of. Wilder will have plenty of opportunities to hit Fury with his best shots in November. If Fury can’t fix his leaky defense, he’s going to wind up getting knocked out by the 6’7” Wilder. It’s obviously too much to ask for to seen an improvement in Fury’s nonexistent punching power. At this point in Fury’s career, he’s not going to suddenly develop monstrous punching power. In the main event in tonight’s card at Windsor Parker, interim World Boxing Organization featherweight champion Carl Frampton (26-1, 15 KOs) defeated #5 WBO Luke Jackson (16-1, 7 KOs) by an 8th round knockout. Jackson’s corner threw in the towel in the 9th round to save their fighter from soaking up needless punishment. The fight had already gotten out of hand at that point. The official time of the stoppage was at 1:21 of round 8. Frampton dropped the 33-year-old Jackson with a body shot in the 8th round.